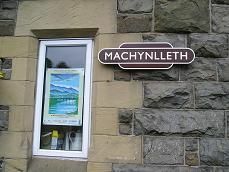 We leave Machynlleth about five minutes late due to the preceding train to Aberystwyth being about 10 minutes late. It's a four-car unit, which separates and then the remaining two cars go to the sidings and a different two-car unit comes into the station. I don't see the logic in that, especially as there are at least fifty people waiting on the station and so the train is pretty full. We travel about five minutes to Dovey Junction, a station in the middle of nowhere and where traditionally passengers from Aberystwyth change trains if they are going to Phwelli. There's no one waiting and no one gets off. We leave Dovey Junction and go straight across a low, mainly wooden bridge and then cross the marshland, before coming onto the left side of the hills on the northern side of the Dovey estuary, which is right next to the track. The line is single now all the way to Pwllheli. We go through a tunnel and have the A493 on our right. The track then clings to the side of the hill. The rock face is covered with netting here, and then we go into a second tunnel. There is a little inlet on the right with boats moored up. We are going about 40 mph and go through a third tunnel, before stopping at Penhelig, a single platform station with a nice wooden shelter painted in red, green and white. It's high above the village, but still right next to the estuary. We go straight into a fourth tunnel, before emerging to more houses and some sand dunes on the left, with a caravan site. Then we stop at Aberdovey station, which has a single platform and nice, well-maintained station building. There are the remains of a second platform on the left, beyond, which is a golf course amongst the high sand dunes. By now the sun is out and the clouds are clearing off the hillsides. It's mainly marsh and scrubland on the left, with sheep and cows grazing on it. On the right are some medium sized hills, with caravan sites before them. We slow and pass the Talyllyn Railway on our right, before stopping at Tywyn station, which is a two-platform station and a train is waiting on the other track. There's a turquoise bus stop on the left platform and the original red brick station building on the right side, with some nice mosaic pictures on its walls. We leave with great views up the Tayn Valley to the right and more caravan sites on the left, all with their lime green coloured caravans. The sea is right next to us now, with large boulders protecting the line from sea erosion. On the right we see the flood plain of the river Aber Dysynni, which we cross over. We move inland and pass through Tonfanau station without stopping. It has just a single shelter on its lone platform. We climb upwards slightly and the sea is about forty feet below us on the left. You can see the coast curving round in a large arc in the distance on the left, whilst the hills are right next to the track now. We pass through Llangelynin station, a single platform station. We then descend again with another caravan site on the left and then we come to a stop at Llangwril, which was once a two-platform station and has a well-preserved station building in red brick, which is now a private house. Two vandalised turquoise shelters are on the platform. We climb up again, with the sea forty feet below us and get the first view of the Barmouth Viaduct. First we go under an avalanche tunnel very slowly and then descend again to Fairbourne, which is protected by a long sea wall, as it is below sea level. We pass the Fairbourne Railway on the left and then come into the station, which has a brick shelter and the original station building is now a private house. There is a campsite on the right next to the station. The train is now full. We go over the marsh and arrive at Morfa Mawddach Station, which has a single platform with a red and green metal shelter. We then go over the estuary of the Mawddach River. At first it is a solid embankment and then it changes into a wooden viaduct. We go across it at no more than 30 mph, before we reach terra firma again and then twist left and right. We go over a cast iron bridge and then into a tunnel. We then go over a level crossing before we arrive at Barmouth station, which is next to a very large car park, but it is only about 1/8 full, due to the recession perhaps. The station has been modernised in recent years, with canopies over both its platforms and a visitor's centre in the station building on the right. About half the passengers get off here, but they are replaced by about the same number of new passengers. We pass a Co-op on the right, which has been built where sidings used to be. Barmouth is quite a large resort with a fairground and several tacky souvenir shops. We pass some caravan sites on the right and then speed up to around 50 mph, as we continue with the sea on the left and steeply rising mountains on the right. We then stop at Llanaber, which has a single turquoise shelter and is on a hillside right next to the sea. There are large boulders by the sea on the left and a caravan site full of identical lime green caravans on the right, as the hills move away into the distance. We go across some sand dunes and pass another massive caravan site on the left. There are now sheep grazing on both sides as we arrive at Talybont station, which has a grand shelter with a curved perspex roof and a telephone booth. The mountains across the bay ahead are much clearer now, as we pass a mixture of sheep grazing in fields and yet more caravan sites. We then stop at Dyffryn Ardudwy station, which has a nice cream and green shelter, with a phone on the left platform. The original red brick station building on the right side is now a private house. We now speed up to about 60 mph, as we pass an airfield on the left, before coming into Llanbedr, which has a turquoise shelter. About twenty people get off here, presumably going to the campsites nearby. There are some standing stones on the right, as we cross over the river Afon Cwn and pass through Pensarn station without stopping. It has a single turquoise shelter. We move across some scrubland now and then come to the sea once again and then stop at Llandanwg, where about ten people are waiting to get on. It is a tiny platform, with only room enough for the second carriage to park up. There is a corrugated iron turquoise shelter here. We are right next to the sea again, which is just ten feet below us. There is now a great view of the mountains of Snowdonia on the right, though the mountaintops are covered in cloud. There is a nice empty beach on the left, then sand dunes take over and we start to slow for Harlech, with the castle high up on the right. Harlech station has a large crumbly white station building, which looks neglected and is covered by iron grills. There are two long grey coloured shelters on both platforms, plus the original cast iron footbridge. Lots of people get off here and about ten are waiting to get on. We wait for about eight minutes for another train to come into the other platform and then that leaves before we do! We then move across a flat expanse of land, where sheep are grazing on both sides. The Snowdonian hills are clearer now and we go through Tygwyn without stopping. We come to a halt soon after at Talsarnau, where you have views across the bay of Portmeiron on the left. Several passengers take photos here, as it was made famous by The Prisoner TV series. Soon after we stop at Llandecwyn, which has a cream and green shelter on its single platform. Then we go over a wooden bridge over Traeth Bach and move to the left passing marshland, before coming into Penrhyndeudraeth station. It has a white station building, now a private house. We move into a cutting and curve slowly round as we go under the Ffestiniog railway line and then stop at Minffordd (for Portmeiron) station. It is on a curve and on the left are the sidings for the Ffestiniog railway and slate quarry. We go into a small cutting and pass the quarry on the right, speeding up to about 50 mph. We then go over the Afon Glaslyn and its estuary, passing marshland on the left and the A497 on a bridge on the right. Then we come into the town of Porthmadog. We pass the terminus of the Welsh Highland Railway on the right and then go over a level crossing and come into Porthmadog station. It has a single glass shelter on the left and on the right is the Station Inn and tearoom and the line is double track here. The train empties here almost, with most people getting off here to ride on the two narrow gauge railway lines in the town. We move westward now with a rocky outcrop on the right amongst all the trees. We then emerge into a barren landscape with views of the sea once more. It is distinctly greener here than further south. We see more hills on the right and some castle ruins on an outcrop on the left as we come into the town of Criccieth. We pass large slate covered houses just before Criccieth station. It has been nicely preserved with colourful pictures on the walls of the station building. There is an old platform on the left, now overgrown with weeds. My carriage now has just five people left in it. We move away from Criccieth and cross flat rough pastureland with sheep on both sides. We see the sea again and looking to the left you can see the coastline to the south where we have come from. We move right next to the sea again, with large boulders in place protecting the line from the ravages of the sea. There is a lovely view of the mountains of Snowdonia on the right, now cloud free. We pass more caravan sites on both sides and speed through Penychain, which has a large stone shelter. It is now marshland on either side, with the A497 on our right. We then pass through Abererch Station, which has a single shelter and platform, with a campsite next to it, followed by another caravan site. We are now doing 50 mph and there are signs that there was once double track here. We then go over the river Erch and then there is a lagoon on the left as we come into Pwllheli. We pass an old signal box on the left and then come into the single platform station about ten minutes early!